Office partitioning is a popular choice for businesses that want to change the layout or division of their work spaces without the major upheaval of a complete refurbishment. Effective partitioning allows you to divide and demarcate your office space in a way that suits your business. The options available range from partitioning an entire floor to simply adding some useful extra private areas like meeting rooms. There is a wide variety of different types of glass office partitioning to choose from. You can pick glass that is entirely clear or fully or partially frosted. You also have the opportunity to add your own designs to your glass partitions, such as your company logo. This can create a real wow factor in your office environment. Businesses often choose partitioning in order to create some private areas – often for meeting rooms or office spaces for senior executives. Partitioning your office spaces with glass means that you can create separate areas – whilst at the same time not making your office space feel too boxy or claustrophobic. You may be surprised to hear that glass also offeres excellent sound proofing, so if you want to create areas where discussions are not overheard, then glass is an ideal choice. 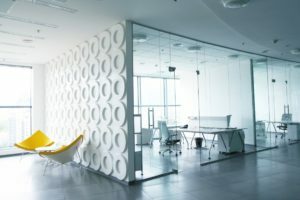 Whether you are adding extra meeting rooms, breaking up your working spaces or creating separate chill out or staff rooms, glass partitions mean that you still encourage the flow of light through your work space, and natural light is normally more comfortable for your employees than harsh artificial light. Ensuring the flow of light through your business premises can also lead to a reduction in the amount of electricity that you need to light your work area – so has potential money saving advantages over the long term. Understandably, companies balk at the prospect of a full office refurbishment. The thought of the upheaval and mess can be off-putting. However, adding selected partitions, including glass partitions is a quick process that can be relatively straightforward and will minimise interference with your daily business. There are a wide variety of different glass partitions to choose from – you can go for a bespoke design or select from wide choice of different designs and features. Modern glass partitions are smart and visually appealing so they can improve and modernise the look of your office by creating a light and airy look, without the necessity for a complete refurbishment. Barnes Interiors are experts in office partitioning and can help with all of your office refurbishment requirements including glass office partitions. Get in touch with us today and we will be happy to provide advice and guidance for your office space.